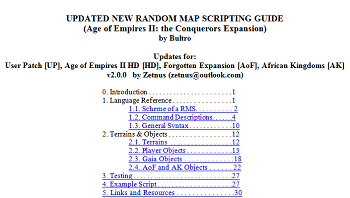 I've written up some updates to Bultro's New RMS Guide to tell people about the new capabilities offered by the User Patch, the HD Edition on Steam, and its expansions "The Forgotten" and "African Kingdoms". Also includes previously undocumented commands that work in all versions of the game. Please remember to check here from time to time in order to get the most recent version! Well v2.0 is out and it's just as great as v1. Again, a fantastic level of detail! Certainly a very useful guide. Up-to-date information on all sorts of obscure commands, and of course the Find function is a blessing. As far as usefulness goes, it's simply unrivaled. It's also very easy to understand. Zetnus has done a very good job at striking the line between "useless waffle" and "no information at all." RMS scripts are generally edited by experiment - I edit mine, Ctrl+S, Alt+Tab to AOE2 and hit Generate Map to see if anything exploded, so there doesn't NEED to be a great deal of intricate detail. Some of it is less obvious, and Zetnus has pointed this out. A very conclusive, very useful guide. Quite frankly, if you're going to create .rms scripts you want this. Thank you for making this, Zetnus! The fact that you reviewed this (combined with various people asking me RMS questions on Steam) has finally motivated my to finish version 2.0 of this guide. That was sitting around mostly finished on my desktop for far too long. Very extensive and informative guide. Undoubtedly a must have for people new to random map scripting. Being such a person myself, originally using the old and outdated guide provided with AOC; the discovery of this guide has been very illuminating as it gave me insight as to why some of the instructions given in the old guide didn't satisfy my expectations when followed. I must also credit this guide with providing a complete reference to terrain and object constants. Instructions are very clear and I have observed no lack of quality. It is apparent Zetnus has put much effort into producing this guide and I'm glad to be a witness of its success. Thank you for the update Zetnus, you see I'm no longer active, I noticed it now!